DRAW PREVIEW: The defending champions Rocasa Gran Canaria ACE will be seeded in Pot 1 at the Tuesday’s draw at the EHF Office in Vienna. 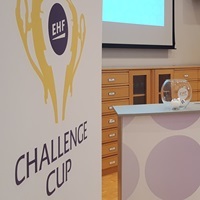 Only two days after the Round 3 conclusion in the Women’s Challenge Cup the last 16 teams in the competition will learn names of their new hurdles as the draw will be carried out at the EHF Office in Vienna on Tuesday 22 November at 11:00 hrs local time. The defending winners Rocasa Gran Canaria ACE will be seeded in Pot 1 alongside their domestic rivals Mecalia Atletico Guardes, which eleminates the only intra-state affair of this round. The draw will be streamed live on EHF’s Facebook page and there will be also a live ticker on www.eurohandball.com and live coverage on EHF’s Twitter.